Pancakes are loved in this house. We have tried whole wheat, regular, birthday cake pancakes, chocolate chip, blueberry, strawberry, and more. Our go to pancake is still the buttermilk pancake though. 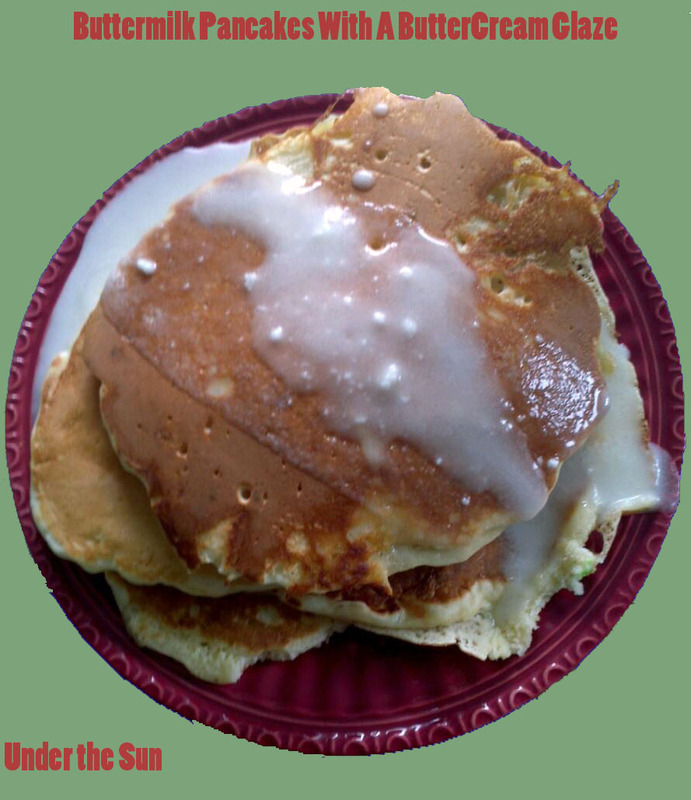 Syrups and glazes just add to the fun and pleasure of pancakes. Since we had pancakes for breakfast today, and Chloe’s birthday is coming up it got me thinking. We enjoyed the birthday cake pancakes, but for us they didn’t taste all that different from normal pancakes. The extra work to make birthday cake pancakes were not worth the extra effort it took to make them. The buttercream glaze on the other hand became an immediate hit. All this got me thinking I would share with you the breakfast I plan on making for Chloe for her 4th birthday, buttermilk pancakes with a buttercream glaze. In a large bowl gently whisk together your flour, sugar, baking powder, baking soda, and salt. In a small bowl gently stir your slightly beaten egg, buttermilk, and cooking oil. Add the wet ingredients to your large bowl of dry ingredients, whisking until your batter comes together. The batter should still be slightly lumpy. Pancakes are ready to flip when the edges are lightly browned and the surface is bubbly. Continue cooking on the other side until the jiggle of raw dough is gone and the surface of your pancakes are light brown. Enjoy***What is your favorite way to enjoy pancakes?***! Add your melted butter and other ingredients to a medium bowl. Whisk the ingredients together. You may need to add a little more half and half if you would like to have thinner glaze. This entry was posted in Homemade, Recipes and tagged Recipe on October 16, 2013 by Sara R.